The prolonged drought may be coming to an end (hopefully) but the river remains steadfastly at a very low level. Castlehill Reservoir has a huge, mostly negative, impact on the river but at these times the compensation flow keeps the river in reasonable condition. It will take a lot of rain to get a meaningful clearing spate, hopefully in time for the salmon run. Despite a couple of poor salmon seasons the river appears to be stuffed with salmon and trout parr. 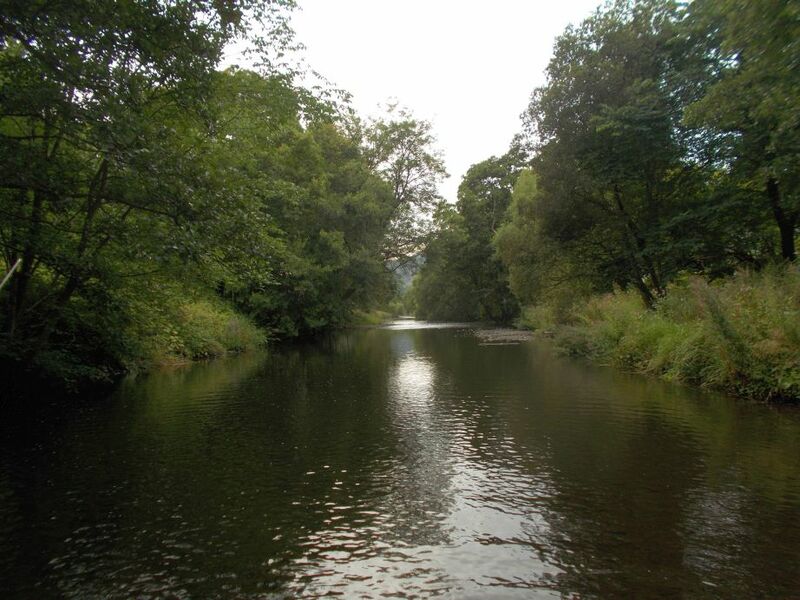 I spent a pleasant evening on Saturday fishing dry flies downstream of Rackmill. I managed to loose two decent fish, frustrating but the multitude of parr attacking the fly more than made up for it. I was catching salmon and trout parr in equal numbers! The thin water has made fishing challenging but there is a reputable report of a fish of 4 to 5lb been caught on the river. Up at Glenquey the water levels have dropped significantly opening up access to most of the north bank (ironically not long after the work party had spent time clearing up the shrubbery). Caution should be taken crossing the second burn along for the dam. 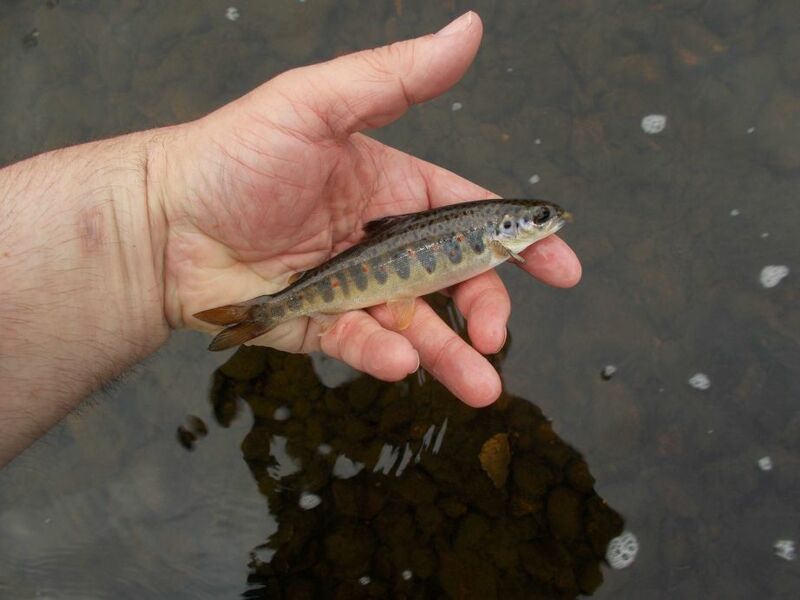 In June Glenquey had 41 visitors submitting catch returns reporting 269 fish being caught to a total weight of 133lb [6.56 fish/return at mean weight 0.5lbs]. In July 49 visitors submitted returns reporting 166 fish being caught to a total weight of 84lb [3.38 fish/return at mean weight 0.5lbs]. The June raffled permit went to an angler from Falkirk and July’s to an angler from Dollar. Please remember returned catch returns go into a monthly raffle for a free permit! Various works have been done by the work parties, particularly the endless toil of clearing vegetation to keep access to the river open. A couple of the committee have also been busy kick sampling to identify the state of health of the invertebrate population. This is a tool which will be used to investigate potential problems on the river for example if the ochre entering the river from Mine Treatment at Vicars Bridge is impacting invertebrates. First surveys above and below Vicars Bridge were very encouraging (Stonefly nymphs, damsels, midge, caddis , leaches and freshwater shrimp were identified. The DAA was delighted to receive a donation of £1000 from EPIC [Enabling Projects in Clackmannanshire] which is ring-fenced. Half the sum will allow the DAA to now support two local primary school with the ‘Fish in the Classroom’ project and the other is to be used for equipment for clearing paths and accesses along the river corridor. We are extremely grateful for the support of EPIC. Hopefully by the time the next update arrives the river will be full of water, hungry trout getting full ready for spawning and maybe even some Salmon! This entry was posted in DAA News, Glenquey journal, River journal. Bookmark the permalink. Had a good afternoon on the Tates stretch with 7 nice trout to the net, two of which were on the 2lb mark and I dropped an absolute belter in a fast run. Pics are on my Facebook page. It’s good to see the rain having effect and lifting the river a wee bit and bringing the fish on the feed. My wee double bead nymph in a 20 doing the business. There are silver tourists in the water and I saw salmon in two of the pools I fish, but I won’t disclose their whereabouts under any circumstances to protect them. Another nearby river I fish has car loads of the spinning brigade out to hook a salmon and the damage that barbed treble hooks do to a trouts mouth that take a spinner is horrific. There are a lot of wee fish in the river too, which is a good sign for the future. There’s no need to stock it again next year. Let the entire river grow wild, the fishing is better that way. 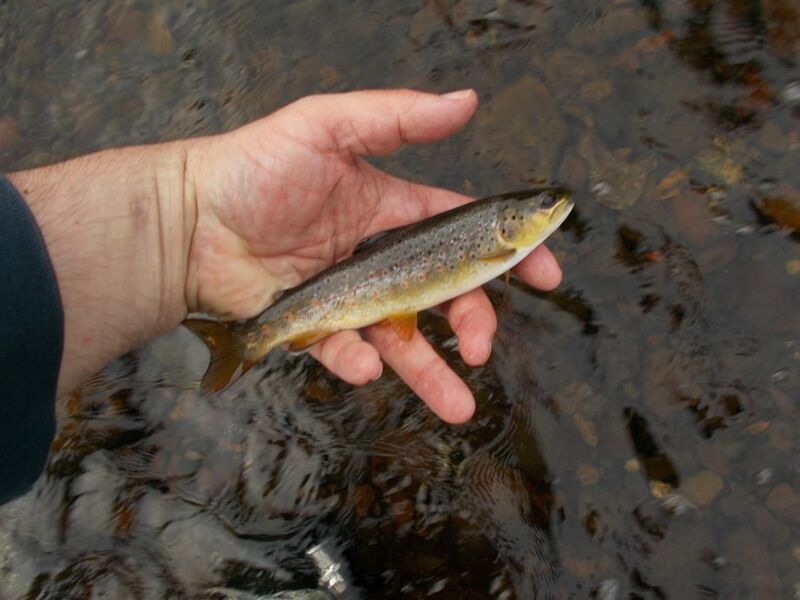 The trout fisheries fulfill that niche for anglers who fish for stockies. I love fishing this wee river. When I go there, it’s me the river, the fish and all that goes on with nature on her daily business, and I forget the world during that time. One final trip to the loch for me and then I’ll leave the trout alone until next year. Anyone that fancies a trip or two for grayling over the Winter months are welcome to join Upstream Nymph and Wet Fly. I’m organising a grayling comp on the Nith with all proceeds going to the Strathcarron Hospice Appeal and you’ll be helping a really worthwhile cause.